The Belize District Chess Association conducted its 3rd annual Family Chess Day this past Saturday January 22nd, 2011 at St. Ignatius Primary School. The event was full of fun activities such as an Art Competition, Chess Puzzle Competition, Level 1 basic training, and for our main event a 7 minutes speed chess tournament for our experienced chess players. A total of 78 chess players ranging from the age of 6 years old to 78 years old and coming as far as Cayo & Orange walk district played in the 7 minutes speed chess tournament. 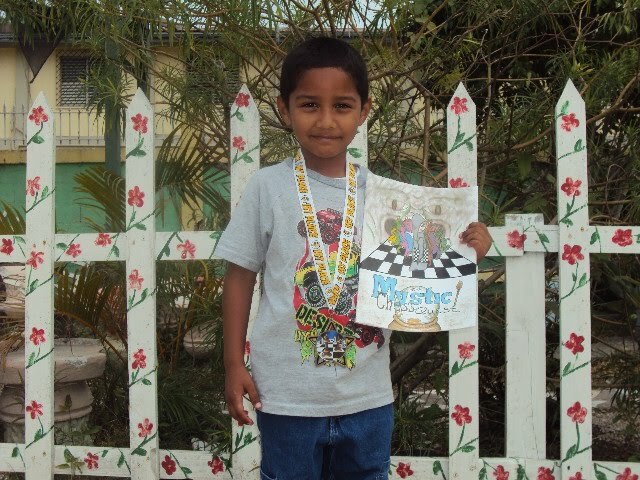 In the Under 8 category placing 1st was Akeem Roches from Grace Primary, 2nd Cesar Escalante from Belize Elementary School, 3rd Clinton Edwards from St. Ignatius Primary School. In the 9 & 10 Category placing 1st place Quinton Rodriguez from Holy Redeemer School, 2nd Kyle Shal from Cayo, 3rd Kyle Rodriguez from St. Ignatius Primary School, 4th Luis Zavala from Orange walk, 5th Maury Leslie from Belize City. In the 11 & 12 Category placing 1st place Dwayne Rodriguez from Holy Redeemer School, 2nd Erwin Wills from Cayo, 3rd Brandon Usher from Hummingbird Elementary, 4th Marco Banegas, 5th Vejea Alvarez Both from St. Ignatius Primary School. In the 13 & older Category placing 1st place Akeem Jenkins from Cayo, 2nd Steve Flowers from St. Johns High School, 3rd Brandon Marsden from Cayo, 4th Christian Burns from Edward P. Yorke, 5th Glenford Pop from Cayo. Six year old Zhair Lizama from St. Joseph Primary School received an Award for being the youngest chess player. Akeem Jenkins (Left) from Cayo & Steve Flowers (Right) from Belize City Playing for 1st place in the 13 & older category. Golden Kings & Queen Chess Team playing against chess Coaches from St. Ignatius Primary School. Volunteer from the Belize Leo Club assisting student with arts & craft. 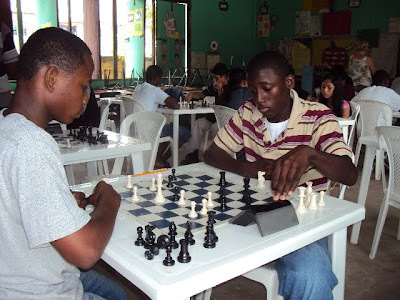 The Belize District Chess Association would like to express its gratitude to St. Ignatius Primary School for allowing us to host our 3rd Annual Family Chess Day. We would also like to thank the Belize National Youth Chess Foundation for providing volunteers and sponsoring the trophies and prizes for the event. 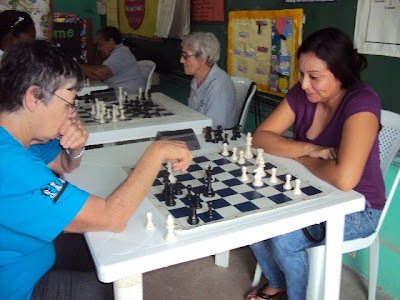 Also we would like to thank the Orange walk & Cayo Chess Association for participating in our event. A warm thank you goes to the Golden Chess Kings & Queen from cayo that sent a team of experience chess player to partake in the event. We would also like to thank the Belize Leo Club for volunteering in the arts section. Finally, we would like to thank the 120 Chess Players, community Volunteers, teachers and parents that came out Saturday in support of our family chess day.